Kath Carney may not be Busega Scotland’s oldest supporter but she is definitely John’s mum. 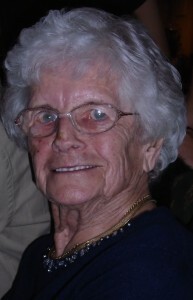 She celebrated her 90th birthday earlier in the year with family and many friends. A veteran of two trips to Africa, visiting Zambia and Malawi in the early eighties, Kath said she would go to Tanzania at the drop of a hat, if she were able. Strangely enough, she doesn’t really like John and Christine working in Africa but thinks Busega Scotland is doing really good work. Kath keeps her African interest going by watching wildlife programmes and documentaries. She is currently reading ‘The White Masaai’, a love story set in the shadow of Kilimanjaro, and said it really needs ‘parental guidance’. Doesn’t look like John will get to read it!